Wisconsin is home to many species of blackberry. Blackberry has many common names, including marionberries, dewberries and loganberries. Blackberries are members of the Rubus family, which also contains raspberries. Many of the blackberries in Wisconsin are native, but some have also been introduced. Cultivation methods for all blackberry varieties are very similar. 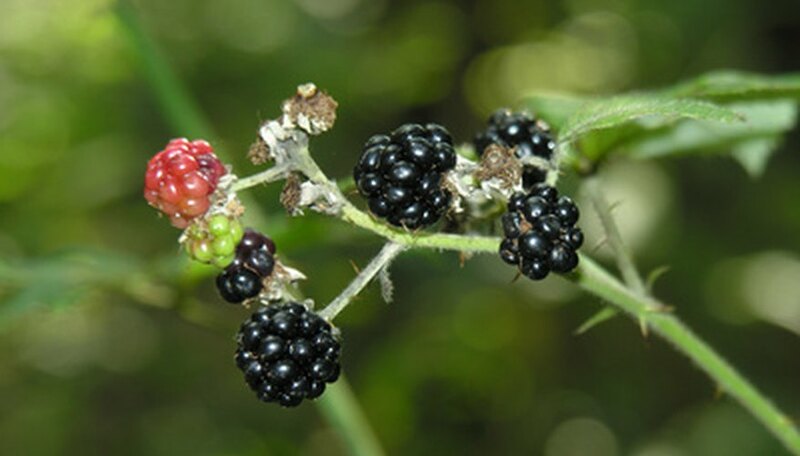 Rubus wisconsinensis, or the Wisconsin blackberry, grows into a rounded blackberry shrub. Wisconsin blackberry will need pruning to keep it to a manageable size. Growing well in most soil types that drain well, Wisconsin blackberry does best in full sun, but can also grow well in partial sun. Wheeler's blackberry, or Rubus wheeleri, is a variety of blackberry that is similar to other forms of blackberry. Wheeler’s blackberries thrive in the same sun conditions as Wisconsin blackberries. If planting any kind of blackberry in Wisconsin, plant upright varieties 4- to 6-feet apart. Make sure you give your blackberries an inch of water per week from June through the end of the growing season. Rubus spectatus, or sphagnum blackberries, are bushes that generally grow in a rounded form. Like Wisconsin blackberries and other berries, it grows best in full sun. It also, like the Wheeler’s blackberry, should be spaced 4- to 6-feet apart and given at least 1 inch of water from June until the end of the growing season. Fertilize this blackberry, and other blackberries, in the spring with 1 to 2 inches of compost or composted manure. The Rubus rosa, or the rose blackberry, is another form of blackberry that grows well in Wisconsin. The flowers of this blackberry are hermaphroditic and contain both male and female parts, making pollination of very easy. Care and cultivation of the Rubus rosa is similar to other species of blackberries. USDA: Classification for Kingdom Plantae Down to Genus Rubus L.